The second season of systematic excavations at Aidonia of Nemea has been completed on July 29, 2017. 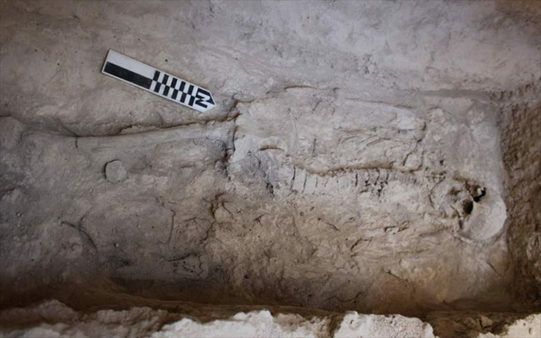 During this season, the graves which were already known since last year’s excavations have been investigated and new burial monuments have been located and surveyed. Moreover, work has been done to protect the monuments and to shape the archaeological site, with a view to the main aim of the programme, which is the overall protection and enhancement of the ancient site. 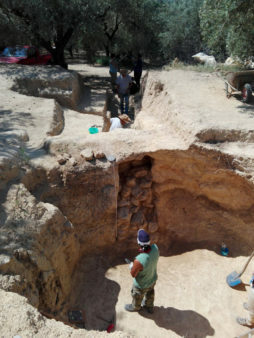 The excavation is being carried out by the Ephorate of Antiquities of Corinthia and headed by Dr Konstantinos Kissas, in collaboration of the Nemea Center for Classical Archaeology (University of California at Berkeley) and its director, Dr. Kim Shelton. The Mycenaean cemetery at Aidonia had been found and ransacked by looters in the 1970s and 1980s. Burial offerings consequently ended up in the global antiquities trafficking networks. In 1993 Greece achieved an important victory in the fight against looting, when it repatriated the Aidonia Treasure a unique archaeological ensemble which today is exhibited at the Archaeological Museum of Nemea along with excavation finds of the cemetery. The systematic excavation and enhancement programme in Aidonia aspires not only to effectively protect and enhance the cultural heritage of the area, but also to gather information which have been lost due to the illegal excavation activity. The Mycenaean cemetery at Aidonia consists almost exclusively of chamber tombs, organized in groups. The chamber tombs are cut in natural rock formations. They have a tripartite structure: a dromos, i.e. 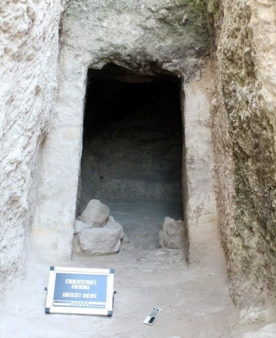 a sloping corridor which connects the level of the ground with the stomio, meaning the entrance of the tomb, which is obstructed by irregular stones, thus sealing the underground burial chamber. During this year’s excavation season at the “middle” cemetery, where the chamber of another tomb had been investigated in 2016, the stomio and dromos of the monument came to light. In the lower cemetery, recent research revealed two new chamber tombs. Although one of them had been totally looted in the recent past, the scientific excavation confirmed its dating to the Late Mycenaean period (c. 1350 – 1200 BC), as well as the limited period of the monument’s use, while its very interesting complete architectural form was revealed. The second tomb was built during the Early Mycenaean period and was in use until the end of the period. It was found under thick layers of deposits with Archaic, Late Roman and Middle-Byzantine remains. This is a very significant monument which bears witness to the historical sequence of periods at the archaeological site of Aidonia. Thus, the systematic excavation fills important gaps in the historical research, created by chronic illegal excavation activity that has hit other monuments at Aidonia as well. The burials were located in three pits and in the chamber floor. One of the pits is monumental. It is almost 4m long and is covered by big slabstones. It contained three burials. In the second pit, two more burials were found, one having bronze arrowheads and five daggers and knives, two of which had handles coated with thin gold foil, while in the filling of the third pit sherds of two imperial wine jars, two monumental floral decoration vessels, which will probably be fully reconstructed, were found. The burials in the floor had simple grave offerings, such as clay pots and stone knobs. 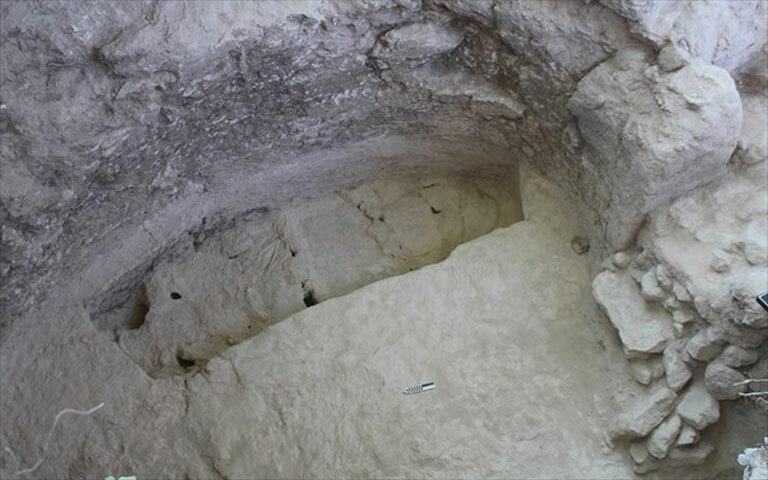 The new finds confirm the periods in which the site at Aidonia was in use. Archaeologists hope to come to conclusions about the role these communities played during the rise and fall of the various central administrative formations, from the Mycenaean toparchia and subsequently politeia, to the city-state of Fliountas, the developments in the Roman province of Achaea and the political fragmentation of the Middle-Byzantine period.